Get gorgeously glossy from head to toe with this multi-tasking, divinely scented oil from Ouai. A smoothing hair oil, a hydrating moisturiser and an intoxicating fragrance – it’s a triple threat that’s enriched with shea and rosehip oils to lock in moisture and impart a radiant, all-over glow. 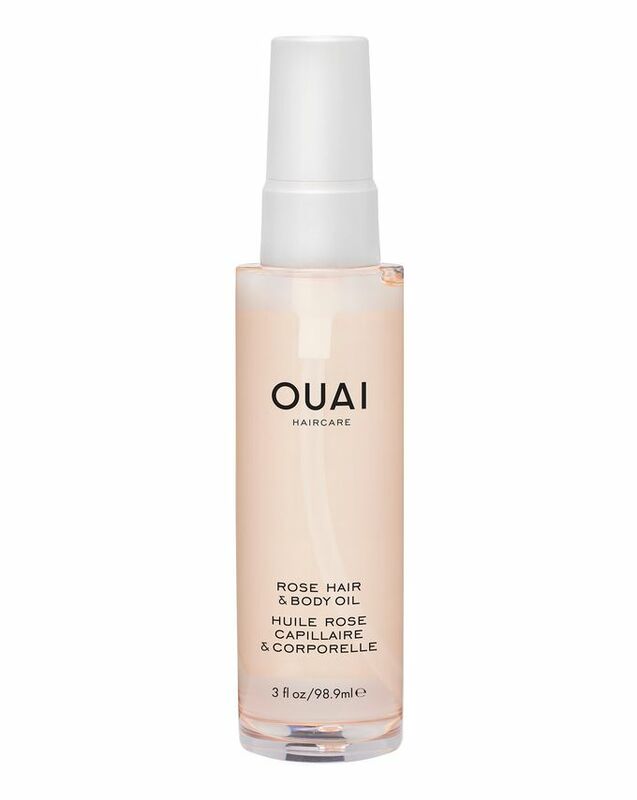 Ouai’s blissfully scented, moisturising Rose Hair & Body Oil is too good to confine to just one part of your body. Enriched with absinthium, shea and rosehip oils, it works to nourish and protect stressed-out tresses – when applied from mid-lengths to tips, it seals in moisture and shine while protecting against heat damage. Applied to thirsty skin (or pulse points, perfume-style) this luxurious oil softens, hydrates and illuminates, imparting a radiant glow. Ouai’s signature fragrance blend of rose, bergamot, lychee and white musk is pretty much impossible to resist and, once applied to your mane and limbs, all will be fooled into thinking it’s your natural scent. Free from parabens, silicones and animal testing, this looks, smells and does good – what more could you want from an oil? Apply a pump from mid-lengths to tips of hair before styling to seal in moisture and shine while protecting against heat damage Rub a thin layer over skin to soften, hydrate and illuminate. Massage into pulse points for an extra dose of OUAI N°5. I've had this oil for a few months now, when I first received it I hated it, left my hair all limp and greasy, even using the tiniest amount, so I left it in the drawer. I hate wasting products, so decided to use it on my dry hair at night, then washing out the next morning and this works wonders for my hair, leaves the ends lovely and soft, I do this about 2-3 times a week. I got this as part of the Jamie Genevieve box. Never thought of purchasing this product before due to price but I definitely will again. I use this on my bleached very dry and brittle hair. It works well to condition my hair. Only down side is, is that it makes my hair more greasy quicker. I am in love with this. Rose scented/themed things are my favourite! And this just smells divine. Only need to use a small amount when putting it on your hair and normally use it on mid-lengths to ends as like all other oils if you use too much, of course your hair/scalp will go oily! I love smelling it on my skin. Will need to buy a million bottles as I feel this will definitely not last me long at all! I bought this product because I saw very many positive reviews on different websites. It does not leave the hair greasy which is a good thing, but I don't feel that much of a difference when I use it. I have dry hair, maybe this is better for thin hair, but for me it doesn't do much. I regret spending 26 GBP on this product. I like the oil more on my body then my hair. It makes my skin soft and God it smells amazing. I hate rose scent but this is nothing like a rose. Smells nice and does an okay job. If you use more then a couple pumps on your hair then it goes greasy. I wouldn’t buy again. This oil is very odd. When rubbing into the skin it disappears immediately, it’s very runny but does dry down. When putting this into hair it’s HORRIBLE, it leaves your hair looking like you’ve poured a bottle of olive oil on it. It doesn’t dry either, so your hair will just look incredibly greasy until you next wash it. I’ve tried using it on my hair in so many different ways and I get the same result each time - incredibly greasy looking hair. I love this product. It smells utterly glorious and saves my fine, brittle, and dyed hair from crumbling to bits at the end. I use two pumps of it on the ends of my hair about halfway through blow-drying, and it really makes a difference. My hairdresser has stopped gasping in horror when she sees my split ends. It’s also amazing on crunchy elbows (look, if you know, you know). This and OUAI’s finishing cremè are my two rides or die hair products. Love this rose oil. The smell is amazing. It‘s better than the other Ouai Oil and leaves the hair really shiny and hydrated. I will definitely buy it again. You only need one or two pumps and rub it into your hair. It doesn't smell as rose oil and makes hair look dirty and oily. The title says it all....don't buy this if you're looking for an oil to use on your hair. But the scent is rather artificial and I prefer the classical hair oil overall. It does the job, but I won't be repurchasing. honestly I was expecting a lot of this brand and this is their first product I've tried and it is really bad. First the smell. It's like the spray I use in the toilets and it really doesn't do anything to my hair...so disappointed. This is sooooo bad it just came in the mail today, DON’T buy it. First of all it smells like an old lady, secondly I put only 1 pump in my palm and dispersed it and than put it on my dry hair or gave like a wet glossy effect everywhere and yep I DISPERSED it. I probably will wash my hair tomorrow again because it weighs down it. It’s just useless my hair is still frizzy but it looks like I put sunflower oil on it. I didn’t try to put it on my body but I don’t really want to and it’s too expensive for such little amount of product to just use as a body lotion. 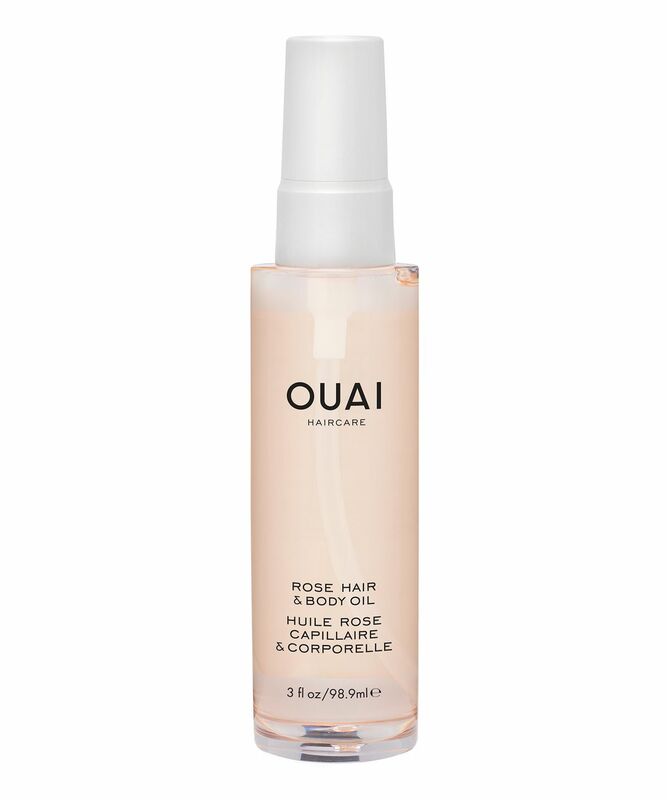 I usually use Argan/Moroccan oils on my hair, but I wanted to give this a go as I love rose and heard good things about Ouai! A little goes a long way, which is good, and it SMELLS GORGEOUS!!! When your hair moves you get a wave of rosy scent! It doesn't make your hair greasy when applying it to styled hair. It also works well on wet hair and then leave to dry, or on wet hair and gently blow dried! My hair has been so shiny and healthy! It's also lovely on your skin - especially after showering - it sinks in and smells lovely! Unlike the Ouai hair oil that smells divine, this one smells strange and nothing like a rose or any other flower. It smells expired and bitter. How this one was released from the lab and a bunch of chemists all agreed this smells good or even ok is beyond me. Absolutely strange. Of course, smell is a very individual preference but trust me this has nothing to do with the definition of “good smell”. 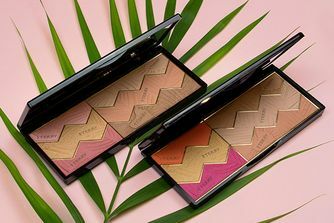 Yes - skin feels nourished and has nice glow and with the right amount it’s not bad for (my, curly) hair, but the strange scent wins over what the product does, which isn’t exiting. Do yourselves a favour and go buy the NUXE dry oil instead - you’ll thank me. Received this oil in the Jamie Genevieve Cult Beauty box and I have to say it’s lovely! Such a light fragrance and it’s super absorbent! Just all round a lovely product!! I got this in the Jamie Geniveve Cult Beauty box and it's great. It smells gorgeous, dries down very quickly for an oil and leaves both your hair and skin feeling wonderful. A little really does go a long way with this product though so don't over do it or you will end up greasy. I normally use davines Ol oil but thought I would try this product, I don’t think it smells that nice and don’t feel it really adds any benefit to my hair. I was fairly disappointed by this, to be honest as I was expecting more. I have gone back to my davines one and haven’t even finished the bottle of this first which says it all really. Not for me sorry. This is a great product. Made a huge difference to my hair. I love the way it makes my skin feel. The smell is amazing too. I use just a tiny bit on my hair before drying them. Looks cool, smells nice. I got this in the goody bag and after reading Veronica’s review regarding her father and decided to use it on my 9 year old who has eczema down the backs of her legs that I and doctors have literally tried everything on and nothing has soothed or treated it like this oil. It’s amazing. As it was only a sample size I managed to use this on her upper and lower legs 4 times and it’s almost gone completely. Like Veronica’s father, she has stopped scratching which means there are less new open sores she also doesn’t complain that it’s too greasy or thick stopping her pulling on her school tights or leggings which for me is a bonus as we can apply it without fuss. I will now be ordering the full-size version. It doesn't quite smell like a rose but the smell is still lovely, it's airy and flowery and not overwhelming. Haven't used it on my hair yet, but it is an amazing body oil. My father has terminal cancer and suffers from dry, flaky skin after target meds and radiotherapy. His skin is extremely dry and fragile, lotions and creams do not work at all. He scratches himself endlessly and couldn't sleep at night because it was too itchy. We tried this product yesterday after consulting the doctor, thinking we had nothing to lose. After just 1 application his skin appears soothed and moisturised, and it absorbs nicely, doesn't leave any residue(neither on him nor me). For the first time in months, he was able to sleep through the night without scratching himself until his skin breaks. We had 3 more applications today and everything is going uphill, some of the less affected areas even appear quite normal and is no longer dry, wrinkly...the more damaged areas might need more work though. I have already ordered some more! I do not like rose scented product but this oil smell amazing. The absorption is also very quick. So I definitely buy it again. It’s so bad, please splurge on something else. I just receive this one day ago and I already felt in love. Normally I hate hair oils, because they make my hair look greasy and weight it down. I just took a few spritz into the palm of my hands and rub it to the ends if my hair. It absorbs so fast which I love it. Also I did use it on my arms and after a few seconds it was already absorb from my skin. I love it. And the smell is to die for. I could not stop to smell my hair. Definitely a product which I will buy before it runs out.